Kia plans Golf GTI rival | What Car? 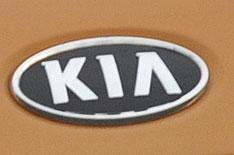 Kia plans to add some glamour to its range with a VW Golf GTI-style hot hatch and a convertible version of the Soul. They will be part of what the company claims is 'the most aggressive new model strategy in the motor industry'. A pointer to how Kia might be planning to add sparkle to its line-up will be given at the Frankfurt motor show in September, when the company reveals a rear-wheel-drive concept car. The Golf GTI rival has not been confirmed, but overseas marketing director Soon-Nam Lee admitted that the company is working on tuning the suspension of just such a car. It would probably be based on the next-generation Cee'd, which is due to make its first public appearance at the 2012 Geneva motor show. Power will almost certainly come from Kia's new 2.0-litre turbo engine, which delivers up to 273bhp in the Optima saloon. We would expect to see it in 2013. The Soul convertible will appear sooner than that, however. The Soul is due to be refreshed later this year, which suggests that the soft-top which will be a three-door model could be around as soon as next year. Kia will also replace the Carens mid-sized compact MPV next year and wheel out a flagship luxury saloon with a V8 engine, although there are no plans to bring it to Europe. An updated version of the Sorento 4x4 is also less than 24 months away. With each new model, Kia continue to downsize its petrol engines by using smaller, direct-injection units, many of them turbocharged, to reduce fuel consumption and CO2 emissions, and there will be more widespread use of the company's ISG engine stop-start system with the same goal in mind. There will also be new transmissions, including an eight-speed automatic, a twin-clutch robotised manual like VW's DSG and a continuously variable auto. Under Kia's alternative fuel strategy, an all-electric small crossover will go on sale in 2013, plus a range of hybrids starting with the Optima and continuing research into hydrogen fuel cell vehicles, which the company has committed to producing in small numbers from 2012 and in modest volumes for sale in 2015.